Sullivan’s Travels, This Gun for Hire, I Married a Witch…Lake is one of my great favorites. Smart and sardonic, but full of heart. Something about her suggests a survivor who’s making the best of a fallen world. I read her auto-biography as a teen, so I don’t remember much. But I do remember a passage in which she describes drinking gin while making blueberry pancakes. And that she describes a post-Hollywood life working as a diner waitress while having a doomed love affair with a burly longshoreman. Sardonic is one of my favorite descriptions, even better if it applies to drinking gin while flipping pancakes. I think I have to read this book! Thanks for the tip. I just have to jump in here with a thought or three about Ms. Lake’s autobiography, as it is one of my favourites (and I have reviewed it a few times over the last 10 years). It is called “Veronica” and is co-authored (or ghost-written, depending on your take) by Donald Bain, who is probably best known for “sharing” a by-line with Jessica Fletcher in the series of Murder, She Wrote books based on the television show. Regardless of who wrote what in “Veronica”, it is a terrific look at her distinctive and charmingly prickly personality. I highly recommend finding a copy! Here is one of the more interesting excerpts: “Merchant seamen look a certain way. Spencer Tracy? All the senior airline pilots in the world? All people cursed with premature wrinkling? Leathery skin? Romance through squinting eyes? I don’t know. But Andy was undoubtedly a seaman and so were his two friends. It wasn’t even debatable.” Thanks for letting me intrude, Vickie and regularpop! You, my delight, may jump in anytime! Love the quote and have requested it from the library. Thank you, too!!! Thanks to these lovely photos and the compelling recommendation of maedez, I’m gonna have to read it again ! Here’s hoping my library has it as well. Many thanks to Ms. Lester and Ms. maedez. Thank you! Perhaps I will pipe up a bit more frequently in future. I hope you enjoy the book. Whatever its veracity, it is a wild ride! Whoops ! I meant to say thank you for this absolutely gorgeous and witchy Lake photo! You are most welcome 🙂 . Perfect, just perfect. I have only one thing left to say…. Ring the bell, close the book, and light the candle. I am sending Uncle Arthur and Serena down to pick you up… they will be there in three nose wiggles. tink a tink a tink. 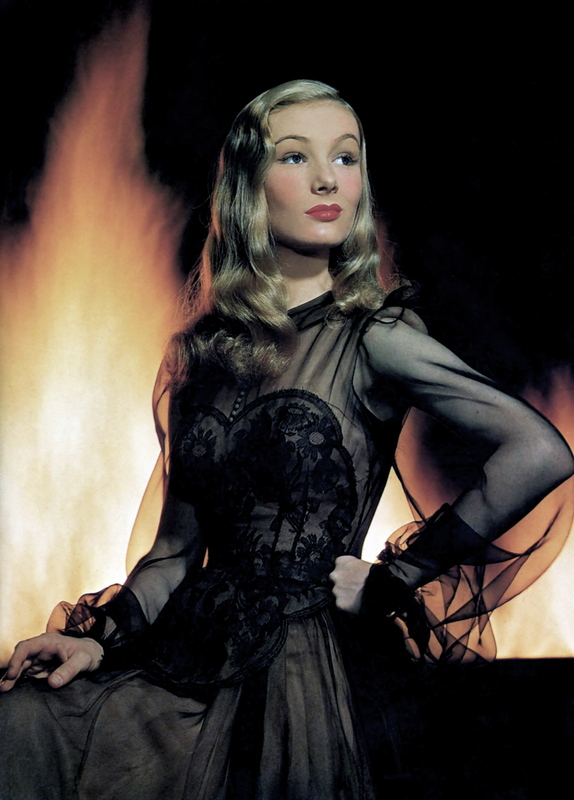 Love Veronica Lake and I Married A Witch. I find Ms Lake very appealing, and it was so sad what happened to her. Her wit when talking about herself was refreshing yet melancholy. Fabulous picture!